180 Gram Audiophile Black Double Vinyl in Gatefold Sleeve. The Pianist is a 2002 biographical drama film, directed by Roman Polanski. 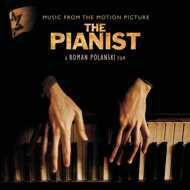 It is based on the autobiographical book The Pianist, a World War II memoir by the Polish-Jewish pianist and composer Władysław Szpilman. The film was a co-production between France, the United Kingdom, Germany, and Poland. The Pianist met with significant critical praise and received multiple awards and nominations. It was awarded the Palme d'Or at the 2002 Cannes Film Festival. At the 75th Academy Awards, The Pianist won Oscars for Best Director (Roman Polanski), Best Adapted Screenplay (Ronald Harwood), and Best Actor (Adrien Brody), and was also nominated for four other awards, including the Academy Award for Best Picture. It also won the BAFTA Award for Best Film and BAFTA Award for Best Direction in 2003 and seven French Césars including Best Picture, Best Director, and Best Actor for Brody. The Pianist soundtrack's consists of 11 tracks, eight are Chopin compositions played by Polish pianist Janusz Olejniczak, one is an orchestral composition (from the film) written by Polish composer Wojciech Kilar and played by the Warsaw Philharmonic National Orchestra of Poland, and the collection concludes with a rare, remastered performance of Chopin's Mazurka Op. 17, No.4 by Wladyslaw Szpilman himself, recorded in Warsaw in 1948. In 2003, the music won the César Award for Best Music Written for a Film, and was also nominated for the BAFTA Award for Best Film Music.